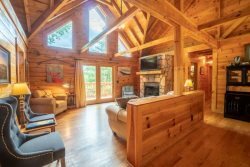 A wide variety of cabin rentals ranging from Downtown Helen, Ga to no more than 20 miles out of town! All wooded rentals are near the Alpine Village of Helen and most are private and offer complete serenity. For the guest who wants to stay away from elevation, mountain terrain,and be close to town, our Wooded-Forest rentals are the perfect vacation destination.